Eastowne Family Physicians | We specialize in your health. A family physician takes care of the whole family. We create caring relationships with patients and their families, and really strive to know our patients. We take the time listen to you and help you make the right health care decisions. We want you to have peace of mind when you choose who tends to your family. Our entire staff of physicians are board certified and trained in all major medical areas. We diagnose and treat the full range of ailments you and your family may encounter. Your personal medical information is worthy of the utmost security. We take keeping it safe very seriously. We employ the use of Electronic Medical Records and operate with state-of-the art computer equipment and encryption techniques. Think family medicine is the right choice for you and your loved ones? We do too. Contact us below to book your first appointment – or if you’ve seen us before visit your patient portal to get us on your schedule! 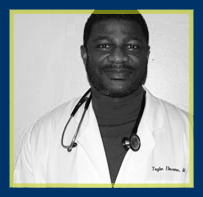 Dr. Ekwonu specializes in Family Medicine and has been in practice since 1999. He completed his residencey at the Bronx-Lebanon Medican Center in New York City and is board certified through the American Board of Family Medicine. He is also certified in Opioid Addiction and HIV Treatment through the American Academy of Addicition Medicine and the American Academy of HIV Medicine, respecively.